September 14, 2016, 8:44 a.m.
Sports Direct is back in the news, this time for what should be more positive reasons than their other recent appearances. We have covered how consumer perception of the brand has fallen over the past year as investigations uncovered damaging practices within the organisation. This culminated in owner Mike Ashley’s appearance in front of a select committee of MPs during which he admitted that some staff that worked in a Sport Direct warehouse had on occasion been paid less than the minimum wage. Therefore the news that Sport Direct was to move staff away from the infamous and controversial ‘zero hours’ contract policy was welcomed, though this change in policy is only for retail staff, not agency workers. Though it was probably not their primary aim, company bosses would have hoped this announcement would have granted the company some much needed positive PR. However, YouGov BrandIndex data instead suggests that perception of the company has actually fell again in the wake of the news. Its Buzz score (whether a respondent has heard something positive about a brand in the last fortnight) has fallen by 10 points to -31. 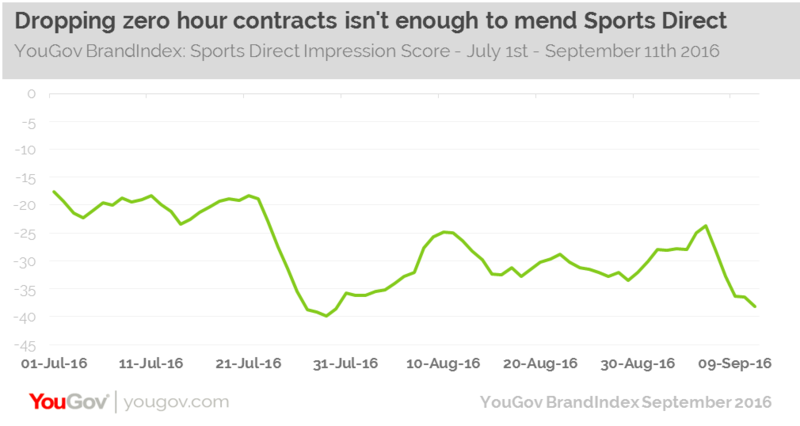 Sports Direct’s Impression score, a measure of whether a respondent has a favourable impression of a brand, has fallen by 15 points since the announcement was made. In the past we have seen that bad press doesn&apos;t always affect the bottom line. Sometimes reputational damage from company behaviours does not translate into lower sales figures, because the product&apos;s desirability of the commercial offer outweighs opinion about its policy. And so it is notable that our data on Purchase Consideration (whether a respondent would consider buying a product from a brand) has also decreased, falling by 4 points in a week. While the company has accepted that their previous working hours policy was hurting sales and not only image, and therefore needed to be reversed, our data clearly shows that in itself that is not enough, they now need to create some positive buzz that rebuilds attractiveness to shoppers.